Upon first meeting Stacie Richline, you would assume she’s the typical bubbly, bright yoga instructor that you’ve come to see on social media and around. The truth is, she is exactly that and so much more. The co-owner and head teacher of Water Dog Floating Yoga hasn’t followed the traditional path to becoming a business owner and yoga instructor. Fun fact, she isn’t only certified in yoga. Stacie has certifications in Stand-Up Paddle Board Yoga, Ashtanga Yoga, Yin Yoga, Piloxing, and Mat Pilates. And she’s in school at Del Mar College getting her associates in accounting. It’s safe to say this former teacher turned fitness instructor has a thing of all things learning. Stacie was born and raised in Greensburg, Pennsylvania, about an hour outside of Pittsburg. She’s always been active, even running Division I cross-country and track for Penn State University before graduating in 2002 with a degree in Business. But it would take some time for her to find her passion for teaching fitness. Following her graduation, she received her teaching certification in business education in 2004 and moved to Key West, Florida. There, she taught high school business and coached the girl’s cross-country and track teams. During her summers, Stacie would travel overseas to teach English in places like Europe and Machu Picchu. It was these travels that inspired her to move to Sendai, Japan for a year and a half before heading to Abu Dhabi for five years. It was in Abu Dhabi that she found her love for teaching group fitness classes such as cardio aerobics. However, it was her family that brought her to Corpus Christi five years ago. Following her dreams, the right way, is one of the biggest life lessons Stacie has learned so far. She says “follow your dreams but don’t go in blindly” when she speaks of what it took for her to open her studio. With the help of Josh, who has owned and operated Richline Technical Services for over 18 years, she put together a business place nine months to a year and a half before she started the studio. Now with the studio in its second year, the yogi and dog lover says following your dreams should be done mindfully and with the right intention, and that sometimes you need to look before you leap. Being present and in the moment is something she strives to do in her every day life, especially when teaching or engaging with someone. This was apparent when I asked her about her favorite kinds of yoga. Stacie says she loves Ashtanga Yoga, but sometimes is can be a little too strict, which is why she teaches a modified version of the Ashtanga Primary Series at Water Dog. She also teaches Yin Yoga, her other favorite. Yin provides a more relaxing, deeper stretch kind of practice. So what does a typical day look like for Stacie? If she’s teaching and working it involves anywhere from one to two classes today (public or private), working part time with an accounting firm, and finishing up her associates at Del Mar. If it’s a day off? You can find her curled up with a book somewhere or downtown with her husband eating fish tacos at Executive Surf Club or participating in one of the many events Corpus Christi has to offer. Especially if the event or restaurant is dog friendly. The Richline’s two Shelties, Shetland Sheepdogs, are always around. 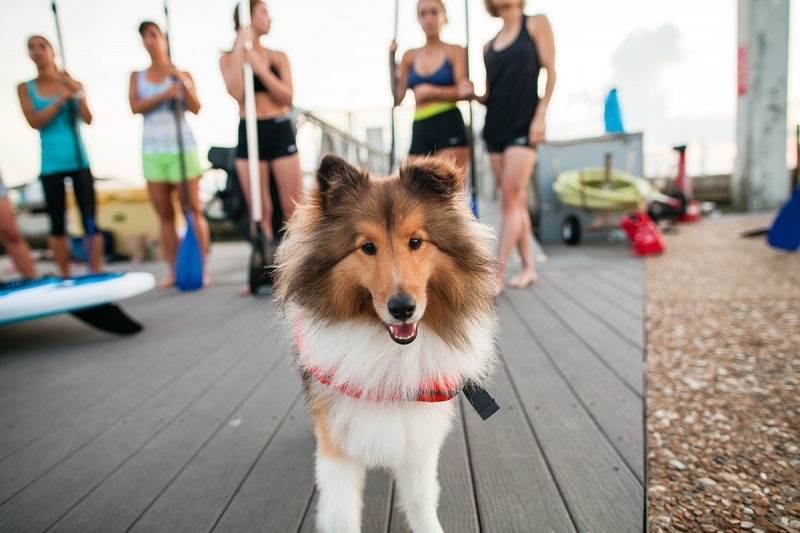 Five-year-old Habibi, which is Arabic for honey or sweetie – inspired by her time overseas, and two-year-old Pearl love to join their humans at any of the patios downtown and sometimes make an appearance and Water Dog’s Sunday Paddle Conditioning classes. When asked what she sees instore for herself and Downtown Corpus Christi, Stacie says she wants to continue to bring yoga into beautiful outdoor spaces. Connecting yoga and nature is one of her passions and she hopes to grow and expand her already successful practice. She has no regrets about switching careers after being a school teacher for 12 years and deciding to open her studio in the Corpus Christi Marina. Her visions for downtown aren’t so different. She believes it will continue to be a place where people spend time and enjoy during all hours of the day while maintaining its local, community vibe.